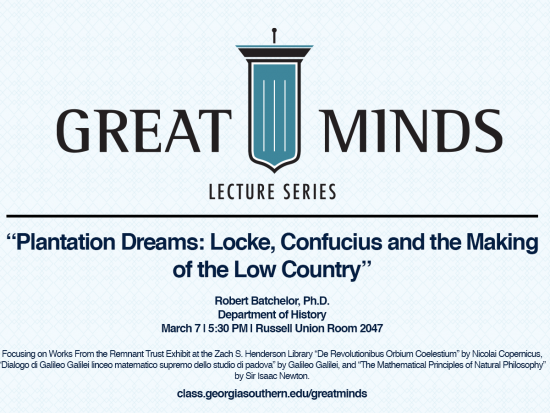 The College of Liberal Arts and Social Sciences’ (CLASS) 2017 Great Minds Lecture Series continues with Robert Batchelor’s, Ph.D., “Plantation Dreams: Locke, Confucius, and the Making of the Low Country” on March 7 at 5:30 p.m. at the Russell Union, room 2047. 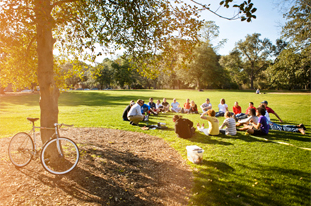 Batchelor is a Professor of History and Director of Digital Humanities and joined CLASS in 2002. His lecture will focus on how our understanding of the political and economic thinking of the southern colonies in particular emerged in the context of global debates about how to constitute governments. 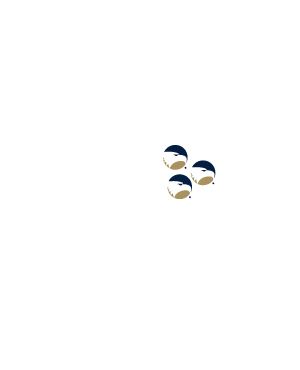 “The Glorious Revolution in Britain (1688-9) was an important antecedent for the American Revolution. Most commonly, this is associated with the thought of John Locke, who wrote the famous Two Treaties on Government (1689) and had a hand in writing the first constitution of the Carolinas (1669). More surprisingly, French ideas about the virtues of agrarian society in China–The Morals of Confucius (1694)–also played a role in shaping early ideas about the plantation society of the South, the nature of political authority, and its connection to moral virtue,” Batchelor said. Both Two Treaties on Government and The Morals of Confucius will be on display at the lecture. Both documents can be seen daily at the Zach S. Henderson Library’s Remnant Trust Exhibit. Also on display from the library’s Special Collections is Richard Walter’s A Voyage Around the World.